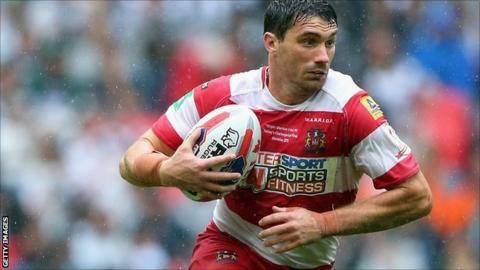 Wigan half-back Matty Smith says his side will take encouragement from their second-half performance against New Zealand Warriors in Hamilton. The Super League champions warmed up for the World Club Challenge with a 46-22 win over the Warriors. Wigan take on Sydney Roosters on 22 February at Allianz Stadium. What is the World Club Challenge? The World Club Challenge is an annual fixture played between the Super League champions and the winners of Australia's NRL. The 2014 match in Sydney will be the first to be staged in Australia for 20 years. "It was scratchy in parts but I thought it was a great second half from the boys," said Smith, who captained Wigan in the absence of Sean O'Loughlin. The World Club Challenge is an annual fixture played between the Super League champions and the winners of Australia's National Rugby League (NRL). "We've a lot to work on for next week," added Smith, who was also skipper on Friday as Wigan began their Super League campaign with a home defeat by Huddersfield Giants. "We wanted an 80-minute performance and I don't think we were quite there tonight, but we were up against a great opposition in the Warriors. "We need to recover properly over the next couple of days and then hit training hard. We need to work on our plays and our defence because I think that is what is going to win us the game next week. "Our defence needs to stand up better than it did tonight."